Everyone needs to work for an income to survive, but it’s ‘passive income’ that truly lets you thrive. Before we expand on this and explore the 7 top reasons to create such an income, what exactly does it mean? In short, passive income is money you earn passively. Once you’ve made an initial investment of time, effort, and finance, revenue is generated automatically; with minimum effort needed to maintain and refine the business or money-making model. Affiliate marketing is one of the best methods for creating a passive income online, because once you’ve found the right product or service and the channel to promote it, you’re making money even when offline – for example, developing evergreen content on your blog that generates organic search traffic, or finding the right PPC keywords to target and drive profitable paid traffic to your landing pages. With a few tweaks here and there, many of your affiliate marketing campaigns will run on auto-pilot! Pursuing passive income forces you to completely change your outlook on what work and income actually are. You begin to assess the value of your time, your future, and what you really want out of life. That’s a positive mindset to be in! Everyone knows about building a savings pot and finding secondary revenue streams to keep you secure in an emergency, but if your secondary revenue stream is also passive, you’re in a much better position. Whether you lose your primary job, are facing an unexpected bill, or any other negative financial predicament, your passive income will still be there. What’s more, because it takes little effort to maintain you can use that spare time to find a new primary job or otherwise fix whatever led to the emergency in the first place. Even if your passive income doesn’t quite bridge the gap, you can still get help from established online loan sites like ElcLoans to give you more breathing room. We’ve all at some point been stuck in a dead-end job that takes up all our time for little money to show for it. 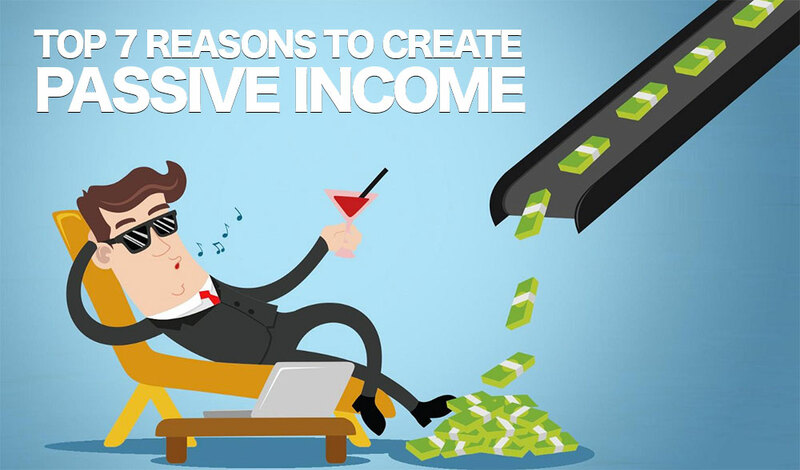 Fortunately, passive income gives you an escape route and the ability to increase your earnings exponentially. For example, once you’ve set up one affiliate marketing campaign, the next step is to repeat the process. Your success should begin to snowball and as your free time and money increase so too does your ability to find other revenue streams and investment opportunities. Because passive income is earned without much continual effort, it frees up your time. The more passive income you make the less time you have to spend stressing out about work. Since stress is not just a negative feeling (it can actually contribute to everything from heart disease to depression), you may literally be prolonging your life by creating a passive income. If that’s not a good enough reason, we don’t know what is! Some people are lucky enough to do what they truly love for a living, while most of us have other hobbies and passions that we might prefer to occupy our time at 9 am on a Monday morning. Passive income gives you the freedom to do more of what you love, and who knows where that might take you? Many of us have ideas that could become something more if we had more time to dedicate to them. Or maybe extra leisure time is your goal? Want to hang out with friends more often, travel the world, or just sleep until noon a few days a week? Passive income can help you enjoy your life and not spend most of it working. One of the most common reasons people cite for not starting a family is that they’re too focused on their career, and one of the most common reasons people cite for being dissatisfied with their job is that they don’t spend enough time with their family. Building up a stable passive income puts you in the best position to have and raise children, even if you only take advantage of it for those early formative years. One of the ultimate goals and benefits of building a passive income is the ability to retire early. And, whether you’ve built up a giant million-dollar empire or just have a couple of profit-making websites or affiliate marketing campaigns, that income will continue into retirement. Ultimately there are dozens of reasons why passive income will change your life for the better, depending on your own wants and needs. If you’re having success affiliate marketing or generating passive income in other ways, and want to share how its helped you, let us know in the comments below! Previous articleWhen Do Videos Work For Your Campaign? Allows You to Enjoy Life–This is the most compelling reason for me to create passive income. In fact financial freedom is the real freedom and to achieve it one must work hard to create passive streams of income.